According to another paper (page 569, below equation 14), the above relationship exists in a number of the industrial manipulators they studied. What's the reason behind this relationship? I am not sere about the conclusion of the paper in general as it can be considered a bit outdated with respect to the "famous" manipulators configuration nowadays. You can easily find the dimensions on the manufacturer websites and check if that relation holds. Concerning the paper you refer to, you can see the cost function $\kappa$ as equivalent the static force manipulability index, so the criterion used is the maximization of that index. Not the answer you're looking for? 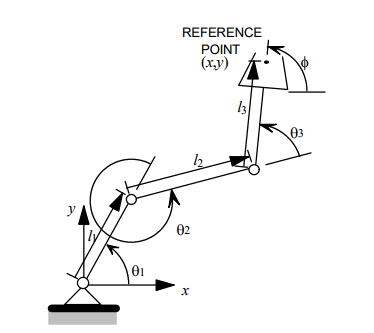 Browse other questions tagged robotic-arm kinematics inverse-kinematics manipulator forward-kinematics or ask your own question.